We all grew up hoping the things of our dreams and fantasies were real, but as we became adults, fantasy faded and was replaced by reality. One of those creatures we wished was real was the fabled unicorn, but you know what? The young at heart know they’re real, and they don’t believe in you either! Unicorns Don’t Believe In You Reality Mints are the ‘in yo’ face’ breath mints for true believers. When the mystical creatures think about humans, they must put them in the same category as the Loch Ness Monster and King Kong. If humans refuse to believe in unicorns, then they won’t believe in us. Sure, it sounds a little childish, but who are we to say that somewhere out in this big universe there isn’t a magical, horned horse waiting to be discovered? 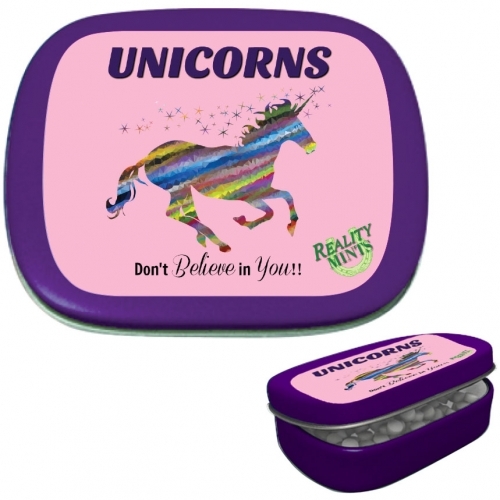 - Collectable tin reads: Unicorns Don’t Believe In You!! If faced with a real unicorn, you’ll probably want fresh breath as you try to calmly talk your way out of a horn ramming. They may be magical creatures of fairy tales, but don’t let that mystical charm fool you. One good rush, and you’re impaled. Keep safe with Unicorns Don’t Believe In You Reality Mints. What creature can go on a killing spree when confronted with minty fresh breath? They say music soothes the savage beast, but they never ticked off a unicorn.